We are on the boat, in our home port of Macedon, NY. We had hoped to start our voyage today. Our technology had other ideas! Cap had installed the new dual-motor assembly, but after a test drive, he noticed transmission fluid in the bilge. That was a sign he needed to adjust the alignment. Furthermore the new generator's water-cooling system was not yet hooked up. We were waiting for the big Fed Ex truck to deliver the special hoses. But you know our motto: "We have a plan, and we're not sticking to it." While the Captain labored down in the engine room (cue the clink of tools and the sound of aggravated muttering), the crew was grateful to take a "make and mend" day. "Make and mend" is the term Britain's Royal Navy uses to describe a day when, instead of cruising, you catch up on boat chores. 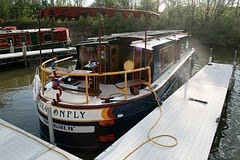 Sitting in port over the last few weeks, Dragonfly had accumulated a layer of grime, inside and out. So the crew mopped and dusted and polished the brass till all was literally shipshape. As you know, a clean boat is a happy boat! solar panels have replaced the old maroon canvas cover. Meanwhile, Cap successfully adjusted the motors, and by late morning, we were nosing out into the canal for a test drive. Cue the trumpet fanfare: the new motors and enhanced battery bank exceeded expectations! Cap will guest blog soon with all the intimate details for all you gear heads; suffice it to say that we zipped along at the (for SlowBoat) sprightly pace of 5 mph and yet, at the end of the test, the solar panels had made as much energy as we'd used. One advantage of the new drive system compared to the old one: no drive belts. That meant, no unpleasant thrum-thrum-thrum if you accelerated just a shade too quickly, causing the belt to slip. Just a smooth, quiet ride. Take a look at the photo on the left--that's the control panel for the boat's original YanMar diesel engine. 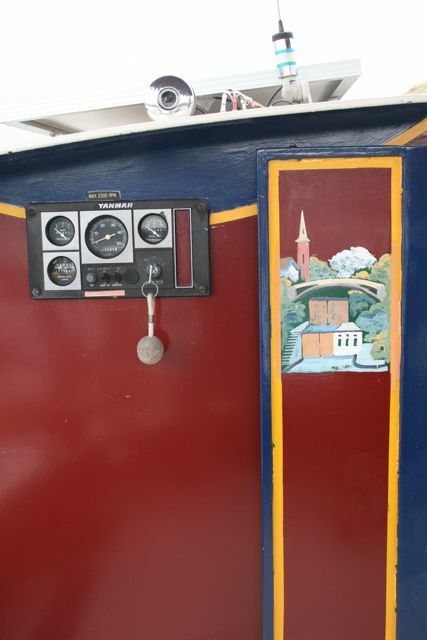 Now look at the photo on the right: with the engine gone, Cap has moved the gauges for the electric system so you can see them from the stern deck (no more ducking inside to check how much of a charge is left on the battery bank). Also notice the marine radio in the image at right. It was originally installed inside the boat, where the pilot couldn't reach it. Awkward when you need to radio ahead to a lock, or deliver a bon mot to the powerboating moron who just waked you. (On our Great Loop trip, we kept a portable radio in reach on the stern, but it's not as powerful as the radio installed in the boat.) Now the radio is within reach! But When Do You Actually Start Your Voyage? Hopefully, tomorrow (Saturday, June 2). Here's a bit of pretty Erie Canal scenery to tide you over till the adventures actually begin.